The vegetable garden is usually one of the first steps taken towards self-sufficiency. Who would want to do without plump tomatoes and fresh watermelons cracked open on a hot day? However, there are some edibles that aren’t well-known by many gardeners—plants such as ground nuts, goji berries, goumis, hardy kiwis, and medlars. These plants have some advantages over the “traditional” veggies that make them worthy of a spot on your land. First, they are perennial; once you get your hands on one and get it established, most of your work will be harvesting. Second, some of these plants fit in places where you can’t grow your vegetables anyway. And finally, these plants help to add variety to your homegrown stock, which is helpful for adding “spice to your life” but also for providing backup in case your corn is carried off by raccoons or your tomatoes don’t survive the blight. Groundnuts were a major food source for the American Indians and can still be found near deserted villages. The first settlers in Jamestown and Plymouth Rock depended greatly upon this plant for survival, especially when the corn supplies ran out. The groundnut was also greatly appreciated by Henry David Thoreau during his stint at Walden Pond. The groundnut is part of the legume family (Leguminosae). It is a small vine that twines around and upon the shrubs of the forest floor. The leaves are smooth and light green with five to seven sharp-pointed leaflets. 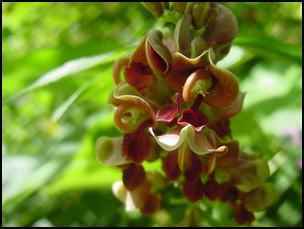 Flowers bloom in clusters and are maroon or lilac brown and the bean pods are about 2-4 inches long. While the beans are edible, the real eatin’ is in the roots. The plant forms long string-like roots with tubers that are roughly the size of walnuts; these are the groundnuts themselves. These tubers are perennial and can be harvested year round—a great attribute during February when the pantry is growing bare but the asparagus in nowhere in sight. Some say that the tubers taste better after the first frost. The groundnuts are high in starch and protein; they have three times the protein of potatoes. Once the nuts have been washed and peeled, they may be boiled for about twenty minutes, roasted, or fried in butter or bacon fat. Generally, you can use them any way you would use a common potato; just don’t eat them raw. The taste is like a turnip, mild and slightly sweet, and the texture is smooth. In order to enjoy this food, you must eat it warm because they become tough and unpalatable when cold. The groundnut is easy to plant. In the wild, they are found in rich moist soil near thickets, stream banks, and open woods, so you can select a spot that mimics these conditions. Because the tubers spread, it is wise to amend a broad area of your soil. Groundnuts do have one drawback: you must wait one or two seasons before harvesting. However, the groundnuts offer three benefits to make gardeners smile. First, they can be found wild from as far north to the Great Lakes all the way south to Florida and from the east coast out to Texas; in gardening terms, that means they are hardy in zones 4–9. Also, the groundnut is a nitrogen-fixer and so won’t require much fertilization. Furthermore, they are easier to handle because they only grow 6–12 feet long; just be sure to keep the new vine from drying out. The vines can be planted three inches deep next to a support such as a tree or a trellis. I bought my groundnut vine at a local herb festival. Vines can be obtained from Brushwood Nursery and NativeVentures.net sells seeds. It is not recommended to dig up wild plants because they may be protected in your area; however, you may be lucky enough to find a neighbor or local gardener who can share some vine with you. 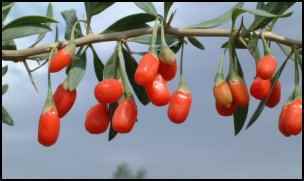 You may have heard of the wolfberry under the buzz name of goji berry (though I think the name wolfberry is what originally convinced my son to eat the fruit). 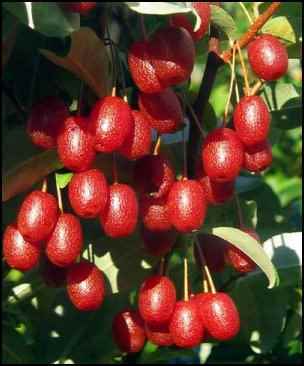 The wolfberry is native to the mountains of Tibet and was brought here by Chinese immigrant workers. They are used extensively in Chinese medicine for everything from diabetes and liver problems to fatigue, fuzzy thinking, and cancer. This seems logical given that wolfberries contain 18 of the 20 essential amino acids and have more vitamin C than oranges, more beta-carotene than carrots, more calcium than broccoli, and more antioxidants than any other known food! The Wolfberry is a member of the Solanacea family and is a wild bush that grows between eight to ten feet. It blooms with small white and/or purple trumpet-shaped flowers between June and October and the fruit can usually be harvested from July to October. The fruit turns shiny red, is oblong in shape and tastes sweet and juicy. The fruits are usually found dried but they can be eaten out-of-hand. The dried fruit can be used in most instances where you might use raisins—muffins, quick breads, some rice dishes, and with stewed meats. The Chinese use the fruit to make nourishing teas, soups, and wines (yum). They are easy to grow once they are established. Since they originated in Tibet, they have been easily cultivated in states like Utah; however, many gardeners have had success in other parts of the country. The plants will grow in almost any type of soil and will tolerate partial shade. However, for the best berry production, think of their mountain home and plant them in a hot, fairly dry, very sunny place. Wolfberries have extensive root systems (probably to deal with craggy surfaces) and are very drought tolerant. The plant can tolerate temperatures between -16F to 102F and is naturally pest and disease resistant, as well as self-fertile. I purchased my plant from Useful Plants here in western North Carolina. Plants can also be found at www.timpanogosnursery.com and www.territorialseed.com. The goumi also hails from China and Japan. Like the wolfberry, the fruit of the goumi is used in Chinese medicine; in this case, it is reputed to help with coughs (leaves), diarrhea (fruit), and sores (roots). This is probably due to the plant’s astringent qualities. The fruit is a very rich source of vitamins and minerals, especially vitamins A, C and E, flavanoids and other bio-active compounds. Surprisingly, it is also a fairly good source of essential fatty acids. Research may show that it is also helpful in halting and healing cancer. The goumi is a deciduous bush that can grow to 6 feet. The small, creamy-white flowers bloom in May and have a pleasant aroma similar to lilac. The fruits follow in June to July; they are red and about the size of small pie cherries with one large seed inside. 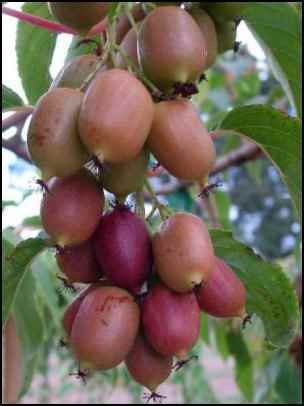 The fruits have a sweet-tart flavor which taste like a combination of apples, black currants, and cherries. It is best to allow the fruits to fully ripen (but look out for the birds, especially robins, that love to eat them) for the most sweetness and be sure to harvest gently as the stems can be easily damaged when reaching for the hidden fruits. The goumi fruit may be eaten fresh, dried, or made into pies or preserves. Like other fruits, the bush doesn’t begin to bear until two or three years after planting. Goumis are also easy to grow. In the wild, they can be found in woodlands, under dappled shade, or on the sunny edge of the forest. They can tolerate sandy, loamy, and clay soils as well as poor soils, as long as the site is well drained. Being a hardy plant, they can tolerate drought as well as exposure to sea water and air pollution. The plant is hardy through zones 4 – 8, with the foliage being able to tolerate temperatures down to -4 F and the roots being able to tolerate temperatures down to -22 F. Some other advantages of this plant is that it is self-fertile, nitrogen-fixing, and resistant to pests and diseases. I purchased my plant from Raintree Nursery but they can also be purchased from OneGreenWorld.com and JungSeed.com. The hardy kiwi might be the next “gourmet” fruit you see in the grocery store, marketed as baby kiwis or kiwi berries. These vines were also known as “Chinese gooseberry” and are native to the mountains of southwestern China where they grow on and around trees and bushes. One of the benefits of the hardy kiwi is, since it’s a vine, it can be grown in a place where you might not otherwise plant. Most homesteaders are looking to use every available inch—why not make use of the vertical? The vines can grow vigorously, especially the male, so it’s important to have a strong trellis or support. The flowers, small and cream colored, bloom between May and June; the plants are dioecious and you will need one male for every eight females. However, self-fruiting females such as the Issai and 119-40B do exist. The vines may not flower and fruit until the third year. The fruits vary a little between the different varieties but are generally fuzz-less and the size of grapes. They have a sweet-tart taste like a mix of citrus, melon, and strawberry. The flesh may be green, orange, or yellow. The male plants do not produce fruit. The fruits reach their full size by mid-summer but don’t fully mature until September; when you think they’re almost ripe, pick a few and allow them to soften for a few days. When the flavor seems sweet enough, harvest all of the fruit and refrigerate them. They will last in the fridge for five to six weeks and will ripen at room temperature in two or three days. One hardy kiwi has five times more vitamin C than an orange, more than twice the vitamin E of an avocado, and more potassium than a banana. In addition, hardy kiwis have a large amount of the enzyme actinidin, which tenderizes meat, and pectin, which makes them a good candidate for preserves. Despite the name, the hardy kiwi is not easy to grow, especially in the beginning. This is often due to the gardener not selecting a well-draining spot or neglecting the young plant after transplanting. It may be wise to grow them in a container for the first season and transplant in the second season after all danger of a spring frost is over. Water the plants well, but not excessively. Select a planting site that has good air drainage, is protected from high winds and is not frost prone. The soil should be a well-drained loam, since heavy clay soils make plants much more prone to root rot. In addition, regular fertilizer is necessary. The other difficulty, aside from getting the vines established, is danger from frost. The hardy kiwi begins growing and flowering early and thus is susceptible to spring frost. If the flowers are killed, then, of course, there won’t be a harvest. Also, the trunks of young plants can be injured by frost and so it is recommended that trunks should be covered by laying the plants on the ground and covering them with leaves or wrapping the trunks with newspapers. That said, I am not an attentive gardener; for the most part, after the initial planting is done, I mostly come around for the harvesting and a little bit of pruning. Despite my negligence, my hardy kiwis are thriving, so perhaps they’re not too hard to grow. I bought my vines from Raintree nursery but they can also be purchased from GoodKarmaCo.com and I found seeds on Ebay.com. And now, a fruit tree. Apparently, the medlar used to be fairly popular in Europe and very old trees can be found in abandoned orchards and homesteads. Medlar is native to the eastern parts of the Mediterranean and Turkey. The Medlar is closely related to pear, quinces, and apples and is part of the rose family. It grows very slowly to a height of 10 to 20 feet tall and is long lived. The large leaves are oval-shaped and the flowers bloom in late spring, large white flowers that look like a pink tinged rose. The fruit is a couple inches in diameter and ripens from green to dark orange to reddish brown in late autumn. First harvest doesn’t usually occur until the third or fourth year. It is best to leave them on the trees until they drop or after the first frost and when they can be easily harvested; if picked too soon, they have a high amount of tannin and are inedible. These fruits can be used in wine making and made into jelly (they have a large amount of pectin). Most connoisseurs blet them— store them, stem down, in a cool, dark place on top of some absorbent material for a few weeks until they over-ripen and turn into an edible mush. The pulp from bletting is similar in taste to apple butter. One benefit of this fruit is that it is harvested later than most fruits and, because of the time spent bletting, it is one of the few sources of a “natural” fresh fruit during the winter. The only drawback for the gardener is that these trees grow slowly. Other than that, they are easier than to grow than most trees. The planting site should be in a sunny position that is sheltered from the wind. 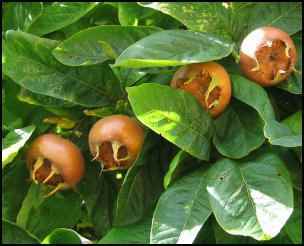 Medlars can tolerate most types of soil as long as it is well drained. The trees have few maintenance requirements: minimal watering, an application of manure or fertilizer in the spring, and pruning for dead, diseased, or overcrowded branches. They are hardy through zones 5-9 and are self-fertile. As far as I can tell, the only source for medlars in the U.S. is from Raintree nursery. Homesteaders are an individualistic bunch with a rebellious streak; as such, I believe some of you will try these unique edibles just because of they’re different. Enjoy the gardening adventure!